The other day I realized that I have written monthly contributions to the Geneva Historical Society’s blog for 5 ½ years. This explains why I find it difficult to come up with a topic some months! Not that I am desperate; history always provides something worth writing about if you just look in a few “dusty corners.” With that in mind I went online and started to look through digitized copies of the 1918 Geneva Daily Times to see what was happening in Geneva in 1918. Through a random selection of dates for the Geneva Daily Times (I did not read an entire year of newspapers), I found some very interesting articles in those papers. 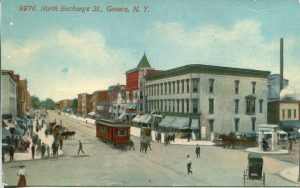 For instance, the Geneva Daily Times for August 31, 1918 was filled with information on the dedications of the new Masonic Lodge and Jordan Hall at the New York State Agricultural Experiment Station. The History of Ark Lodge #33, its former locations and a description of the building were given in detail. The Lodge conducted meetings in 10 different places prior to settling into the former Dutch Reformed Church on South Main Street. A detailed description of the Jordan Hall interior is also given along with the story of the struggle to get the money from the State to construct the building. Dr. Whitman Jordan, for whom the building is named, worked doggedly presenting his proposal to 10 New York State Legislatures. Eight of the legislatures presented and passed a bill to provide building funds only to have them vetoed 7 times by 6 different governors! No wonder they named the building after Dr. Jordan. 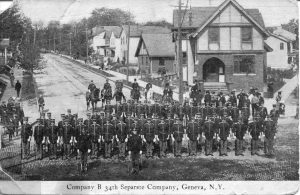 The August issue also mentions the Cadets of Company B (Geneva, New York) beginning their drill training and mentions how the war in Europe affected agriculture among many other facets of life. A page from the September 10, 1918 has advertisements for many different health products including “Gold Medal Haarlem Oil Capsules” which promise “infallible relief from all forms of kidney and bladder disorders.” It goes on to read that for over 200 years it has provided relief from pain and other symptoms of bladder problems. On that same page there is also a list of the men killed and wounded during action the War. It is a long list. The September 30 paper a couple weeks later follows up with an article about how well the French are caring for American soldiers graves. Hopefully this provided a bit of comfort to the bereaved. That edition also contains curious warning notice that the newspaper will no longer be delivered if subscribers are not paid up to date and in advance in accordance with orders from the United States Government. 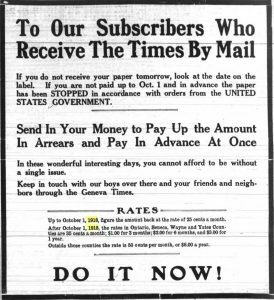 I suppose there was a need to control the use of paper or perhaps ink but it seemed a bit strange use the weight of the Federal Government to enforce something as simple as a subscription payment in arrears. The October 21, 1918 edition carries a headline that says they will begin to draft older men for the Army. Men between the ages of 37 and 45 and below the age of 19 would be considered for the draft. The goal was that the “Army will be big enough to “Walk Through” the German line anywhere.” That same edition also printed an article about child labor in Austria during the war and another on sugar rationing stating that only one teaspoon of sugar would be allowed each person eating a meal in a public place. It suggested that if you had coffee, cereal and fruit for breakfast at a restaurant you would have to choose where to put your sugar. The article also stipulated that no cream with a butterfat content over 20% could be sold to the public and any cream with a lesser butterfat content would not whip so you could forget whipped cream on your dessert for the rest of the war. Plus, the new rules stated that there would be no more banquets or lunches in public places unless they replaced one of the other meals of the day. It appears the goal in this case wass to make sure people aren’t eating four meals a day. In the December 12 edition there were advertisements for Grapenuts cereal, dresses and coats, and a suggestion that people start their Christmas shopping because they can finish it in a week with the help of Geneva’s merchants. There was at least one report on the influenza epidemic, and many reports on the war. That edition also had a brief human interest story about a man who enlisted in the French Army, leaving his 19 year old wife at home with their infant daughter. After serving four years he was captured and imprisoned for 16 years and returned home in poor health to find his wife and child gone. He reenlisted, was wounded and returned to North Carolina to search for his family who he had not seen in over 20 years! There was no mention of him finding his family. One brief article on the page mentioned that there was not much flu in the Village of Penn Yan but there was more in the surrounding countryside. It was followed by the obituary of a Penn Yan woman who died from influenza. An interesting juxtaposition…. There is also a plea for information regarding a Mr. Charles Marshall who became ill, was hospitalized in Buffalo and apparently now had amnesia and only knew he had a connection to Penn Yan of some sort. I believe that life in Geneva 100 years ago had similarities to our life today. Our Sunday advertising inserts still mention Grapenuts periodically, though the pre-sweetened cereals seem to get more space. Influenza is still a worry; this year’s flu got a lot of publicity with the flu vaccine being less effective on the virus than hoped. Wars and insurrections still fill our paper, in places like Afghanistan, Iran, Israel, parts of Africa and sadly still more places. The names of soldiers killed in action are still in our papers even if not in the same numbers as in the First World War Buildings are still being dedicated, the “new” Visitors Center on the lake front being our latest. Many things in life do not change, something, of which, historians are well aware. To look at newspapers on line check out these sites: fultonhistory.com and NewYorkHeritage.org . I am sure you will find something to interest you or something you can identify with. Enjoy!